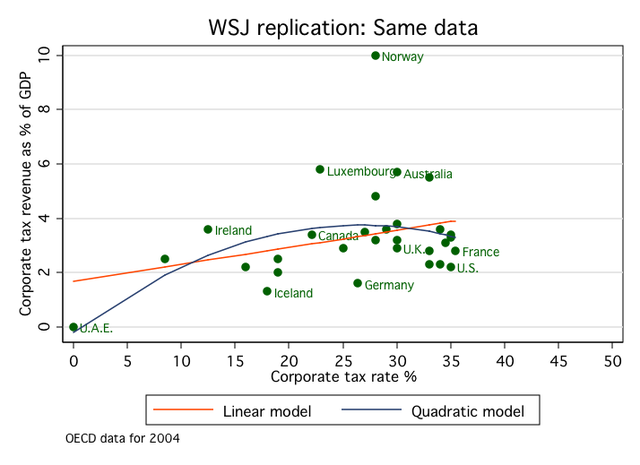 This is the WSJ's assessment of the Laffer Curve - the curve of tax rates and the amount they raise. Professor John Brignal of Numberwatch explains it as somebody whose expertise in maths greatly exceeds that of virtually everybody in the "science" of economics. If economics were a "hard science" like engineering, bearing in mind its importance, it would seek to attract the very best mathematicians. But instead it is a political "science" where advancement depends more on knowing what the employing government wants to hear than on what is true. The Laffer curve is not just a hypothesis that can be, as some left wing commentators suggest, debunked: it is a mathematical necessity. The independent variable x lies between two bounds. Let us call them x=0 and x=100 for convenience. The continuous function y(x) is non-negative between these two bounds. The function y(x) is zero at the bounds: x(0) = x(100) = 0. We discard the trivial case of y(x) = 0 everywhere. We do not have to appeal to the theorems of elementary algebra. It is common sense that y(x) must exhibit a maximum somewhere in the range (0,100). The mechanisms by which such a decline is effected are many and various and are largely anecdotal. As an example, consider the experience of the UK during the Chancellorship of Dennis Healey, who allegedly vowed to tax “the rich” until the pips squeak”. Whether he ever made that remark is moot, but the results of his actions are not. This author was a young(ish) academic at the time and was bemused to find himself sitting round a swimming pool with a bunch of private businessmen (it was a summer party for parents whose children were in the same class at school). The main topic of conversation was “amusing ways of wasting your company’s money to avoid making a profit”. The effects were, however, much wider than that. A subterranean cash economy sprang up almost overnight. There were two prices for almost everything; the invoice price and the much lower cash price. Even the local vicar was known to inquire whether there was a cash reduction. A basically honest society was corrupted forever. You can see other phenomena in modern times, such as mobile businesses upping sticks to move to Dublin or Geneva , where the corporation tax rate is lower. Ireland's place above the graph probably reflects such movement of tax payment to Dublin, but its place is not that much higher than local industrial success suggests. However it seems to me that the normal use of this curve, to show the effect on taxes raised, is limited and reflects the interests of the state rather than society as a whole. Tax avoidance obviously involves making decisions and allocating resources (including to pay accountants) which subtract from national wealth well beyond the loss in revenue. My guesstimate, including Brignal's anecdotal example, is that the loss to the economy, including tax, will be measured by extending the straight line of the graph up to 12.5%. That would mean that for Britain at the rate shown, while CT takes aboutt 3% of GDP it removes just under 8% of GDP from the economy (admittedly that government spending will then find its way back into the economy, or probably about 2/3tds will due to inherent inefficiency) which means the cost to the country is about 6% of GDP. Even at the the rate which maximises the tax take, 26%, the cost to society as a whole is still about 5%. The 2nd unaddressed factor, larger but more difficult to assess, is the higher rate of growth available to countries with lower CT rates. Between 1989 and 2007 Ireland grew at 7% a year going from 60% of British per capita GDP to 140%. This cannot have been entirely, probably not mostly, having CT less than half the average of their competitors, because they also carried out substantial regulatory reform, but I think we should reasonably ascribe 1/3rd of the growth to that. That means lower 15% lower CT rates raised GDP by about 1/3rd (this involves a bit of discounting for compounded growth rates). I'm going to assume, for no good reason, that rates of zero would not have increased Irish growth rates further. I don't think any supporter of high taxes will quibble with that because if I assumed otherwise the case for CT would get MUCH worse. So the countries with around 30% CT rates over 2 decades lost 33% growth in GDP. This means that the amount of GDP lost to the people, as opposed to the government from having around 30% CT rates is, after 2 decades, 33% + 5% = 38% for the whole of us. Even from the point of view of government, not only do they get a marginal reduction on actual tax rake of the real economy, they, assuming that government spending would, unfortunately, remained the same percentage of GDP, they have lost 1/3rd of their total income. Making that assumption about there being no benefit in cutting CT below 12.5% the sensible thing to do for the interests of the nation & in anything but the very short term, the interests of the Treasury, is to cut CT to Ireland's 12.5%. Then we can see if it makes sense to cut further. "Public Engagement on Offshore Energy"
Mike Haseler of SCEF, Robert Malyn and I went yesterday to the Glasgow's public consultation on offshore energy. It was hilarious. Viewers of the comedy 2012 should think of the committee meetings but without the cynical Yorkshireman who actually says what nonsense it. That will give you the feeling. Actually it wasn't a consultation, they are at the "very early stages" so this was a "pre-consultation", then they go for an "appraisal then a "public consultation" & then get some firm plans by Autumn 2013. Right now what we got was a map of Scotland with an outline drawn round it to show where the sea is and a few dots, mainly concentrated north of Cape Wrath, where some marine renewals might be set up. When we got to the questions I started off by asking how much this electricity would cost. "We don't know" to which in a spirit of helpfulness I replied I do and read out the Royal Academy of Engineering figures of production cost per kwh. Though gas prices have dropped sharply since because of the Shale gas revolution and nuclear cost is mainly regulatory. We had a wide range of questions, mainly from us 3 sceptics and a lady anti-windmill campaigner who was well informed and on the other side a man who turned out to work for Vattendall & another who kept repeating that a recent IPSOS/MORI poll showed that 70% of us wanted windmillery so that proved it. Overall, 66% of Britons were in favour and just 8% against when asked: "to what extent are you in favour of or opposed to the use of wind power in the UK" in the Ipsos Mori poll, commissioned by wind trade body RenewableUK. So "70%" is rounding upward. Of course that question includes anybody who is in favour of trying a very little of it, somewhere or other and in the interests of experiment I wouldn't disagree with that as long as it doesn't cost. It doesn't ask if people want to pay extra on their bills for it. As the Guardian article itself shows the results of polls depend very much on the question asked, any previous questions asked in the build up to real question and overwhelmingly, experience shows, the answer the paying client is after. Actually in the discussion that followed we got the closest to a straight answer from the presenters of the evening. I asked if, in its various consultations, on marine energy they had asked the public if we would support marine if told it would cost 10 times the cheapest available (that assumes either US prices for gas or nuclear cost dropping fairly close to its engineering cost) and he said they hadn't but "I think I know the answer to that". Me too. Other questions were - How much of the 5 Gigawatts we now use which is to be 100% renewable by 2020 will come from this - they didn't know, though I got the impression that they are so far from even having a plan that it will be about none. How many turbines will be built - "haven't got any set plans on quantity. Basically a menu without prices, or dishes or tables to sit at. During discussion on how much of these turbines would be made inn Britain (answer - don't know) Mike made a good point. Working from his engineering experience and a report he had researched and written, to get an engineering industry running it is not enough to throw money at one project - you have to build engineering team experience from the ground up over many years. This is a valuable point for my other hobbyhorse of X-Prizes, suggesting a continuity of prizes and thus that an ongoing fund of foundation is essential. The anti-windfarm lady pointed out that the Scottish government had admitted that building windmills etc will produce more CO2 than it will, even theoretically up through 2025. This was vehemently denied but she could name and quote the statement on the webpage. She also pointed out that the Aarhus Convention, to which out government is signatory, requires that the public get real information about government plans,and figures for renewables, which was clearly not being provided here. To be fair the government appears never to have attempted to adhere to these rules - it isn't just waterbound windmills. There was also a question about what plans there were to get power from onsite (mainly Cape Wrath) and the rest of the country to which the reply was none actually but there is an HVDC link between Ayrshire (Hunterston actually) & Northern Ireland. Mike brought up that though we can see windmills kill birds ("allegedly" the presenter ludicrously insisted) it was more difficult to tell what they do to dolphins, whales and more cold blooded fish. The answer would be that this would be prevented by (A) acoustic devices fixed to turbines and (a careful examination during the 2 year "iterative process" of amending the decisions after they were made. That got me asking how many working turbines would there be actually in place during that 2 year process that could be test if they were killing fish. "Don't know". We did get a confirmation from Fiona, one of the other presenters, that all comments received will actually be put up on the website. That will be interesting to see & I will send this thread to them.. The meeting wasn't exactly packed in fact there were 14 people in the audience. At the end i asked, since this is a public consultation, for those members of the audience who were actual members of the public, rather than working for government, quangos, government funded charities and other such organisations. 9 of us raised our hands including the chief audience supporter government supporter. I expressed doubts about that, based on the fact that he used as much the same sort of "2012" PC verbiage the presenters which is when he said he worked for Varrenfall, which is indeed a government subsidy dependent entity. I suspect that even with the 3 of us, the real public were actually in a minority in the audience. The numbers may owe something to the fact that this consultation was only announced publicly last thing last Friday, something which Bishop Hill pointed too with astonishment. Mike said the previous meeting in Edinburgh had had about 18 people. Presumably there are more governmental types in Edinburgh. Protecting "The most Vulnerable in Society"
This phrase is the regular mantra of those opposing cutting government spending. The unstated bit is exactly who are "the most vulnerable". Googling the question led to this quote from Hubert Humphey "those who are in the dawn of life, the children; those who are in the twilight of life, the aged; and those in the shadows of life; the sick, the needy and the handicapped.” which seems pretty fair. Of course it excludes unemployment welfare, unmarried mothers (though not their children) but the author of the article quiting it seems not to have noticed. That seems to be the closest to a definition anybody wants to make. Like so much political sloganising (eg devo-max) those invoking it seem to go to great lengths not to define it. How much of the population can it be. Well "dawn of life can't really be more than 5 years but the large majority will be in families who don't get a lot of "welfare" indeed the vast majority will pay more in taxes than they get.. Pensioners will mostly be getting more in state pensions than they pay, but not that much more. As a ballpark I don't think we can describe more than about 10% of the population as "the most vulnerable" without robbing the term of meaning. If somebody can find anybody who has defined it specifically as more than that I would be interested to see. So do we have to have so much government to protect this group? In a country of 62 million. Which is the equivalent of £109,000 per person per year. I don't think the worst enemy of those on social security could say that the average person on welfare get £109,000. Indeed the government have recently set up a limit of £28,000 for the most expensive household. I would guess the average would be about 10% of that. I know the pie chart above shows 17% (£115) going to Welfare, excluding pensions and health but it doesn't show how much actually gets received, in cash, by those the government claims it is there to help. So if 90% of the money ends up with "government workers and their friends" who are not, by any stretch of language "the most vulnerable in society" when government workers or their fakecharity friends use the term they are dishonestly using the genuinely vulnerable as human shields. 1st Sept - 1902 – A Trip to the Moon, considered one of the first science fiction films, is released in France. 2nd Sept - 1859 – A solar super storm affects electrical telegraph service. The Carrington Event previously described by this blog. We are more dependent on electricity nowadays & such an event could destroy much of the world's generating capacity. 3rd - 1976 – Viking program: The American Viking 2 spacecraft lands at Utopia Planitia on Mars. 5th - 1977 – Voyager program: Voyager 1 is launched after a brief delay. 1984 – STS-41-D: The Space Shuttle Discovery lands after its maiden voyage. 8th - 1966 – The first Star Trek series premieres on NBC. 12th - 1933 – Leó Szilárd, waiting for a red light on Southampton Row in Bloomsbury, conceives the idea of the nuclear chain reaction. 14th - 1959 – The Soviet probe Luna 2 crashes onto the Moon, becoming the first man-made object to reach it. 15th - 1968 – The Soviet Zond 5 spaceship is launched, becoming the first spacecraft to fly around the Moon and re-enter the Earth's atmosphere. 21st - 2001 – Deep Space 1 flies within 2,200 km of Comet Borrelly. 25th - 2008 – China launches the spacecraft Shenzhou 7. 1983 – Soviet military officer Stanislav Petrov averts a likely worldwide nuclear war by correctly identifying a report of an incoming nuclear missile as a computer error and not an American first strike. 28th - 2008 – SpaceX launches the first ever private spacecraft, the Falcon 1 into orbit. 29rh - 2004 – The Burt Rutan Ansari X Prize entry SpaceShipOne performs a successful spaceflight, the first of two required to win the prize. 3rd October - 1952 – The United Kingdom successfully tests a nuclear weapon to become the world's third nuclear power. 4th - 1957 – Space Race: Launch of Sputnik I, the first artificial satellite to orbit the Earth. 5th - 1930 – British Airship R101 crashes in France en-route to India on its maiden voyage. 7th -1959 – U.S.S.R. probe Luna 3 transmits the first ever photographs of the far side of the Moon. 9th - 1604 – Supernova 1604, the most recent supernova to be observed in the Milky Way. 10th - 1967 – The Outer Space Treaty, signed on January 27 by more than sixty nations, comes into force. 11th - 1968 – Apollo program: NASA launches Apollo 7, the first successful manned Apollo mission, with astronauts Wally Schirra, Donn F. Eisele and Walter Cunningham aboard. 17th - 1956 – The first commercial nuclear power station is officially opened by Queen Elizabeth II in Sellafield,in Cumbria, England. 18th - 1967 – The Soviet probe Venera 4 reaches Venus and becomes the first spacecraft to measure the atmosphere of another planet. 22nd - 2008 – India launches its first unmanned lunar mission Chandrayaan-1. 28th - 1971 – Britain launches the satellite Prospero into low Earth orbit atop a Black Arrow Previously on this blog. 29th - 1991 – The American Galileo spacecraft makes its closest approach to 951 Gaspra, becoming the first probe to visit an asteroid. 31st - 2000 – Soyuz TM-31 launches, carrying the first resident crew to the International Space Station. The ISS has been continuously crewed since. Is The BBC Licence Fee Legal? Bishop Hill recently, predictably, lost the last in a series of FoI's intended to discover the identities of what The BBC have given their word were "leading scientists" they consulted in a private meeting before coming to the conclusion that catastrophic global warming was so universally accepted that they could ignore their Charter obligation of "balance". The waiver under which they won was that this is journalism - an exception nominally put in to allow journalists to protect their sources, but used by the BBC to allow them almost total secrecy. The real reason they refused to make it public is that their description of the people at that meeting, while representing the absolute pinnacle of honesty to which anybody at the BBC ever aspires, was a total lie. It was just a BBC selected group of econazis. Of course if I am wrong the Beeboids could sue me for saying untruths about them - but they would have to prove I was wrong. However this fits with a promised legal action by Michael Mann for which Dellors has offered his amused support. Mann is promising to sue a publisher who reported he was effectively a charlatan. As Dellors points out any such suit would mean the defence would have a right to view the very emails Mann has been trying to withhold from a FoI enquiry. Mann has gone to great lengths to fight that FoI in the courts - one reason would be that he fears they would show him to be a charlatan, there may bne other reasons but it is not known what they might be. The BBC connection here would be that "collection and enforcement of the licence fee is the responsibility of the BBC in its role as TV Licensing Authority" which suggests they would, in the same way, be subject to having to let the defence see internal evidence that the BBC had vitiated their Charter by breaching the "due balance" requirement. That means they would be required to show the balanced list of "leading scientists" who allegedly told them they ought to censor sceptical reporting of CAGW. And if it turned out not to be a balanced list but merely the normal ecofascist suspects they would have vitiated their charter - at least as regards collecting the licence fee from sceptics. A further complication is that the European Court has already faced an action on the licence fee. In that occasion they won. Some critics claim that the licensing system interferes with the freedom to receive information and contend that this is a contravention of Article 10 of the European Convention on Human Rights (the right to freedom of expression).The ECHR in Application No. 26907/95 stated "Such an undertaking cannot be successfully accomplished unless it is grounded in the principle of pluralism, of which the State is the ultimate guarantor." and "The interference complained of was, therefore, necessary in a democratic society. There is, accordingly, no appearance of a violation of the applicant's right under Article 10 (Art. 10)." The Principle of pluralism being that "States should regulate the airwaves to provide for a plurality of voices. State monopolies are incompatible with the right of the people to receive information from a variety of sources. Simply allowing private broadcasters, however, is not enough....."
Fairly typical weasel wording to allow state meddling and control but it is quite clear that this makes having a state monopoly (a monopoly being 70%+ of news coverage) which does not actively adhere to the "balance2 the BBC Charter requires a breach of our human rights. There is no question that the BBC refuses to provide any sort of balance in their coverage of alleged catastrophic warming (or many other things). The BBC themselves paid for the Jones report on science coverage to justify them not doing so. The BBC claim the meeting of a balanced group of "leading scientists", as justification for that policy. Was it a sufficiently balanced meeting of "leading scientists" to make this imbalance balanced - they say it was but refuse to say who was in it. A search would show. Thus the government could claim that the BBC are simply 3rd parties being directly funded by the state and that the licence fee is an unrelated tax which we pay to the government and thus have no right to know if the BBC attempts honesty. However if that were said it would be an admission/claim that the BBC has no independence from the government, who enforce no duty of balance, which again makes it illegal and a breach of our human rights under the ECHR. Catch 22. Of course it needs testing. When any government, or any church for that matter, undertakes to say to its subjects, "This you may not read, this you must not see, this you are forbidden to know," the end result is tyranny and oppression, no matter how holy the motives. Mighty little force is needed to control a man whose mind has been hoodwinked; contrariwise, no amount of force can control a free man, a man whose mind is free. No, not the rack, not fission bombs, not anything — you can't conquer a free man; the most you can do is kill him. The underlined bit shows how little is the difference between a state a full scale police state where the police can just "disappear" you and one where the state controls the media and uses it to prevent free political discussion. Admittedly the latter is considerably more comfortable and even safer to live in but it is barely more free. It is also where we in Britain live. The state do undeniably have ownership of a legal monopoly (70%) of broadcast news and a de facto control over even the nominally independent bit. “Death on the Rock” won two major awards as best documentary of 1988, but Thames was to become a victim of a new method of awarding ITV franchises in 1991. The common wisdom is that there was a connection between the programme and the franchise loss. There is no doubt that the new system – foolish and deliberately destructive – was vindictively brought in by the Thatcher government to punish ITV for its supposed excesses and errors. For my money the government were quite right to have these IRA scum killed but that killing what was widely accepted as the best broadcaster of the time, to enhance censorship was a far more important crime and one against the entire British people. There is no dispute now that the BBC state broadcaster censors for political reasons - the BBC itself has boasted of this and paid one of their own £140K to produce an "impartial report" saying why it is a good thing.. Even the BBC do not deny they deliberately lie & censor to promote racist murder on a genocidal scale. Even the BBC do not dispute that the BBC censor in party political matters to prevent free debate. This obviously has attraction to the parties in whose favour censorship works. here is an old article from Iain Dale, normally a Tory liberal & free marketist (except when it counts), explaining why it was right to censor UKIP during the election. They are not standing in every seat (unlike the three main parties) - in fact there are 90 seats without a UKIP candidate. At the last Westminster election they scored only 2% ..
To my mind the BBC has bent over backwards in its news bulletins and other political programmes to include minority parties - far more than in any previous election. I just do not believe that UKIP deserves a fourth podium on Thursday, and I suspect the courts will agree. I look forward to him saying that the Tories, who placed 3rd, at the last European elections should get much less coverage than UKIP, who placed 2nd (& may place 1st this time) up until the next EU election (5th to 8th June 2014), since this is the basis of the argument used to censor UKIP. He is also lying about the "inclusion of minority parties". This inclusion only applies to the state approved "Greens" who do indeed get massive positive coverage - the BNP with twice their vote receive little coverage & none positive and UKIP, with 4 times their vote get 1/10th the coverage, almost all unsupportive. That is not including minority parties it is promoting ecofascism in a patently fascistic way. But if the censorship,of UKIP is not justified in terms used proportionately for all other political debate then we do not live in a free society (such as Russia where even the small parties are guaranteed 21 hours of airtime) and we do not live in a democracy but under fascism which merely retains the trappings of democracy.